As we mentioned in our online video poker guide, almost every online casino offers both a downloadable casino and a flash casino. The downloadable option is best for Windows players who can run .exe files, as they get the best graphics and the largest game selection. However, some players (think Mac or Linux owners) won't or can't download the .exe casino programs. Fortunately, these players can take advantage of flash casinos. In case you aren't familiar with flash casinos, we'll provide a quick overview now: Basically, you visit the online casino of your choice, click the Instant Play/Flash option, and a new browser window will pop up for the casino. Then you just create an account, deposit, and are able to play directly from your Internet browser without downloading a single file. If you are on a Mac or Linux (or just don't want to download the software), then your next step is to pick an online casino. Virtually every online casino offers a flash version, so we have taken the liberty of listing our absolute favorite flash casinos right here. The casinos below offer crisp graphics, and most importantly, a wide selection of flash video poker games. If you already play at the above four casinos, or would like to learn about other online casinos with flash games, check out our full listing of casinos with video poker. Since flash video poker games are played right in your Internet browser, they usually don't have quite the same level of graphics or variety of games that you would find in a downloadable casino. However, all of the casinos in our list above have gone the extra mile to offer comparable graphics, smooth game play, and a nice selection of games. The image above is of the flash Jacks or Better game at Bovada Casino - pretty good, huh? The first reason is if you are on a Mac or Linux computer, and cannot download the Windows-only software. The second reason would be that you are on a computer at work or school where you either cannot download the program because of filters, or do not want to have the program on the computer. The third reason would be that you prefer to play in the browser so you do not have to have multiple programs open and use more of your computer's resources. Ready to play? Check out the realistic flash video poker games at Bovada Casino. 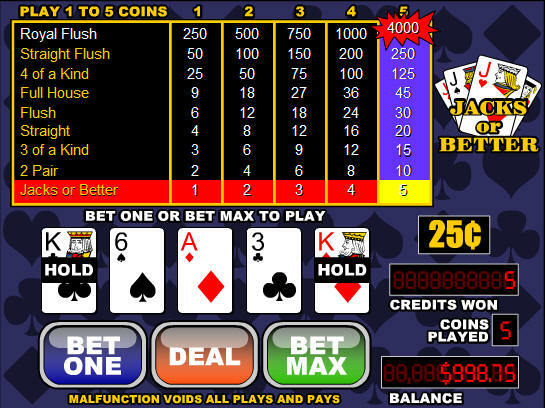 Bovada Casino offers over a dozen video poker games in their flash casino, and all of them have superb graphics and smooth animations. Players can choose between single hand and multi hand machines. Also, Bovada Casino is open to players from all over the world, including the United States! Join Bovada Casino now!